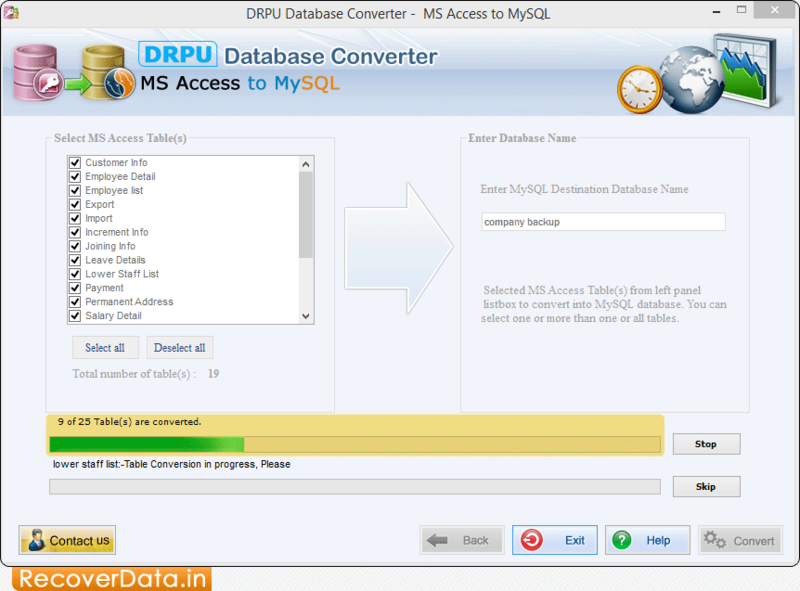 Data Doctor’s MS Access to MySQL Database Converter software converts database records created in MS Access databases to MySQL server record format. Easily convert database table’s records created in MS Access to MySQL database even with password protected MDB file. Database Converter utility tool allows database conversion of single table or whole database records. Software Supports to all major Microsoft access data types, attributes, and works with all major versions of MS access database. MS Access to MySQL Database Converter software converts selected individual tables or entire database records created in MS Access to MySQL Database server record format. Convert password protected MS Access database records into MySQL server record format. Provides supports to all MS Access data types and its attributes. Supports indexes with all necessary attributes. Works with all versions of MySQL and MS access database.